To add a Bible reading to the plan, click on the Bibles bar in the Library. As you can see from the examples, you can specify multiple extracts from a book. Click on Search and the verses you chose will be listed below. If you are happy with the result, click on the ⊕ symbol (below the Bibles bar) to add the reading to your plan. 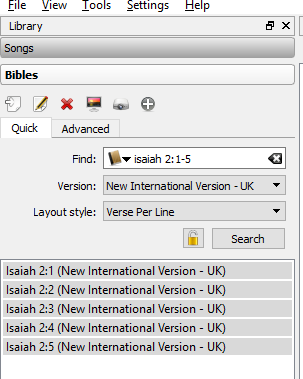 Note that the Bible version we use is 'New International Version - UK'. This will normally be selected by default. Bible readings are fetched from the Bible Gateway website when you add them to a plan. This means that you need to have internet access while adding Bible readings to a plan.